As a big ol’ data geek, I’m by default interested in any metrics that I can get, especially ones related to me. One of the metrics tracked by the Oura ring is body temperature, which is a metric don’t normally pay much attention to unless I think I might be sick, and I haven’t wanted to get sick just to explore this feature of the Oura ring. But a couple of days ago I did something much better: I got my shingles vaccination. My average nighttime body temperature deviation from baseline for February 10 to March 16 2019. Observing that I was under some stress, the ring has been advising me to take it easy for the past couple of days. Knowing that the stress in question was a healthy one, I didn’t take the warning too seriously. The weather was nice the day after the shot, so I went out for a run, despite my ring’s advice. 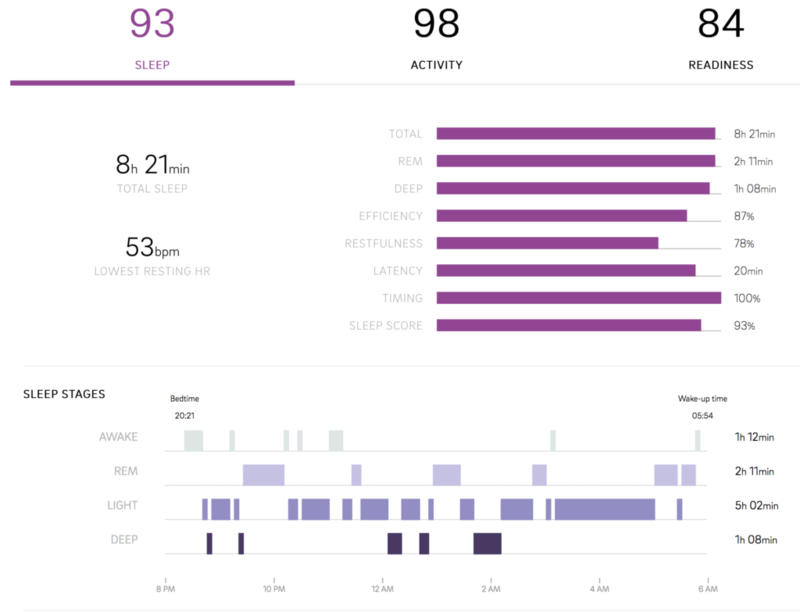 Sleep panel from Oura ring dashboard. Perhaps today will be a good day for a long walk. By the middle of the week we’ll have some more excellent running weather, and hopefully I’ll be ready for it.